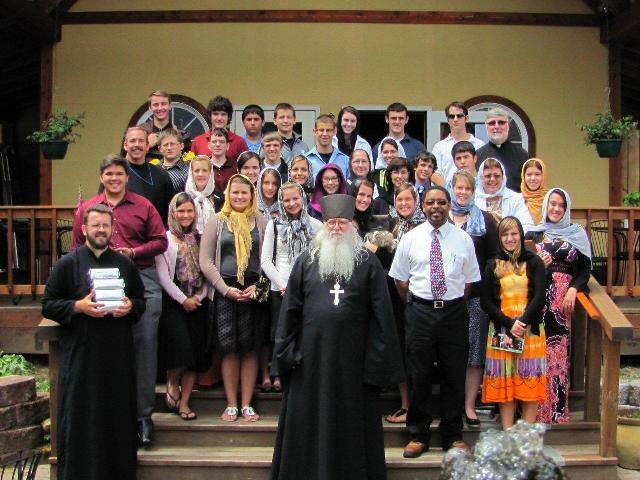 The sixth annual youth conference of the Serbian Orthodox Church in North and South America was held on the campus of Seattle Pacific University (SPU) in Seattle, WI from June 22nd to 26th, 2011. 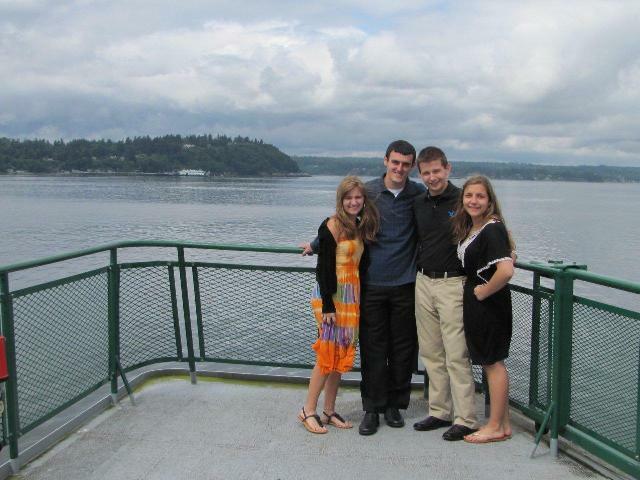 SPU is a Christian university located in a beautiful setting a few miles north of downtown Seattle, WA. The facilities were excellent for our needs. The dormitory, Moyer Hall, consisted of two separate floors with two to three teenagers to a bedroom. The dormitory also included a common area in between floors and in the lobby where many of our activities were held. In addition to the fantastic lodging, the college provided classroom space for our meetings and a cafeteria for all of our dining needs. Finally, the campus included plenty of open space outdoors for the teenagers to enjoy during free time. The Youth Ministry Committee, when planning for the 2011 annual conference, struggled with determining the best dates to hold the conference. The first four years the conference was held the first week in August. Due to camp schedules changing, the fifth year had to be moved to the second week in August which prevented many of our outgoing seniors and teens involved in school activities unable to attend. Additionally, in some regions of the United States schools were already in session this week. The committee decided to move the conference from August to the last week in June for 2011. It is our hope that as our churches and teenagers get used to having the conference in June, participation will increase in future years. Registration took place in the lobby of Moyer Hall, the dormitory where we resided for the week. As the youth arrived for registration, the ones who attended previous conferences were very excited to be reunited with friends that they have not seen, in some cases, for a full year. Several times screams were heard up and down the lobby halls as teenagers found old friends and celebrated seeing each other for another conference. New participants were quickly welcomed into the group. 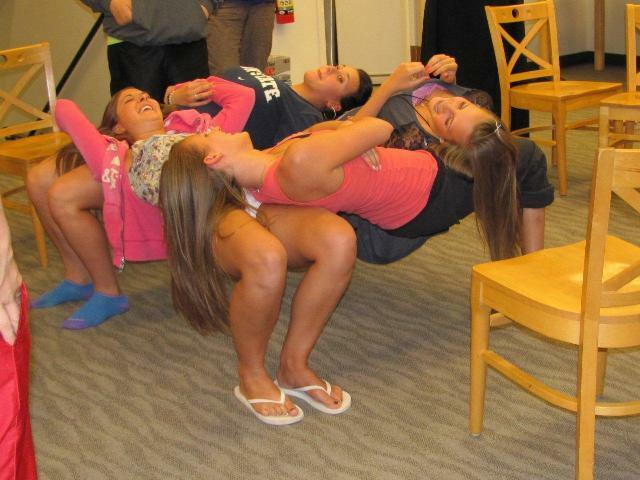 After each teenager received their room key they went off to the dorms to settle in and explore their surroundings. A flight cancellation for a large group traveling from the Eastern Diocese posed a logistical challenge, and resulted in eight teens missing the first evening’s activities. But, by 1:00am Seattle time all participants were present and accounted for on campus. At 5:00 on the first day the entire group congregated in the lounge area for Vespers. 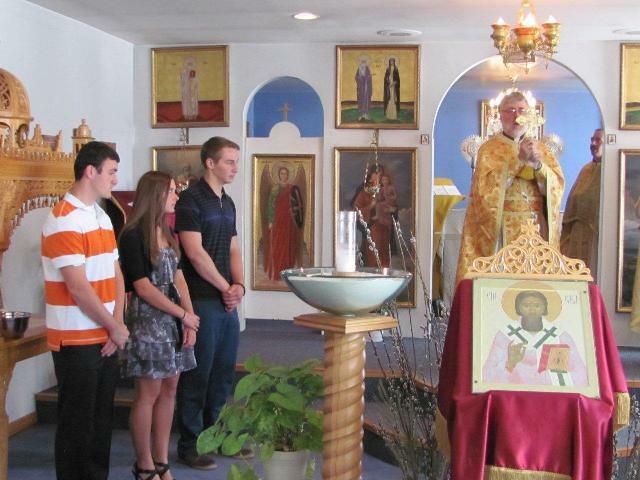 Father Russell Radoicich (Butte, MT) and Father Dragan Petrovic (Indianapolis, IN) led the group through the service. At the conclusion of services everyone went to the dining hall for dinner. took place. Especially moving were the accounts of miracles that Father Dragan and Father Russell have witnessed in their ministries. The evening ended with free time followed by lights out for a lot of very tired participants. The first full day of activities then continued with group exercises. Father Stevo led the group through another round of introductions, this time with the full group including the teens who did not arrive during the day on Wednesday. Then they participated in another ice breaker activity where Father placed a key in the middle of the floor and called out a number, if your number was called the first player to get the key won a point for his or her team. Other than a few bruises the group enjoyed the physical activity and team work. Overbearing parents – just a pitfall of growing up? Sibling rivalry – just a way to keep us humble? How can I show honor and respect to those of my family and/or friends who aren’t ‘nice’? Do parents have a different perception of teens than they did when they were children? Who is “#1” in my family – and what does this even mean? Where is God in my crisis situations? Is coping with stress and anxiety easy or difficult? As an Orthodox Christian, who am I? Mission Impossible: loving the unlovable in my life! True or False: being ‘politically correct’ is the best way to live? At the conclusion of the second discussion session the teens were given a long break to relax and enjoy the beautiful SPU campus. Many went to the bookstore to browse through the SPU themed merchandise while some took the opportunity to enjoy the great outdoor weather. During this time the Youth Ministry Committee met to brainstorm ideas for improving the publicity and communication related to the conference. After some much needed down time the group reconvened for Vespers in the lounge followed by dinner. Two representatives from Orthodox Christian Fellowship (OCF), the national college Orthodox organization, met with the teens to discuss the importance of considering how your faith impacts the decisions you make and the value of joining an OCF chapter in college. Father Russell then coordinated an interactive group discussion session about Christian Leadership. He started with a trust exercise where the teens had to trust each other and work together to keep from falling in different situations. He had the teens participate in an exercise that demonstrated how the top down structure of leadership in corporate America is not effective. Then he drew a triangle showing how Orthodox leadership, the Father, Son, and Holy Spirit, coupled with vision, ambition, and action is the perfect leadership model. He ended the session explaining how this leadership model is applied to leadership in an Orthodox parish. At the conclusion of the session the group dispersed for free time before lights out at the conclusion of the first full day of conference activities. 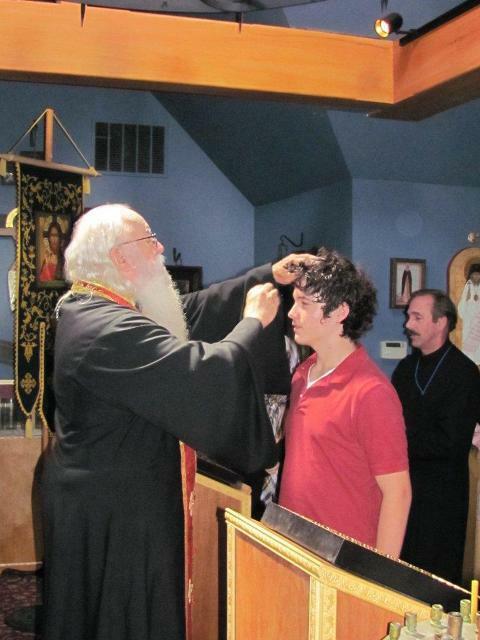 Is there a difference between a ‘custom’ and a ‘tradition’ in our Orthodox Faith? Can I be Orthodox in my every-day life – or will I be made fun of? Praying as a family – realistic or far-fetched? At the conclusion of the morning session Father Stevo presented the participants with three gifts. First, a wooden bookmark titled peace and containing the quote “Acquire the spirit of peace, and a thousand souls around you shall be saved.” – St. Serafim of Sarov. The second gift was a Conciliar Press booklet titled “Building a Habit of Prayer” a collection of prayers compiled by Fr. Marc Dunaway. The final gift of the morning was another Conciliar Press booklet titled “Communion: A Family Affair – Why the Orthodox Church Practices Closed Communion” by Father A. James Bernstein, one of our conference panelists. This booklet explains why only Orthodox Christians are permitted to partake of the Holy Gift of Communion. The group then ate a quick lunch and boarded the shuttle for this year’s service project. Every year we work with local community organizations within the host city to find a service project that benefits the people of these communities. We have been fortunate to assist with some extremely meaningful organizations and help many people. This year is no exception. We travelled to Kent, WA to work in the warehouse of Northwest Harvest. “In 1967, Seattle community members created Northwest Harvest to feed the hungry. Today [they] continue to fight hunger across Washington State through our network of partner food banks, meal programs and at-risk elementary schools, providing millions of nutritious meals each year to those in need.” - http://northwestharvest.org/. The organization supplies food to 325 food bank affiliates throughout the entire state of Washington. During the fiscal year ending June 30, 2011, they shipped over 25 million lbs of food. Supported by local businesses and volunteers, they are completely funded by private donations and do not rely on any state funding support. Northwest Harvest has an ultra modern, state of the art, warehouse facility in Kent, WA, about 20 minutes south of Seattle. 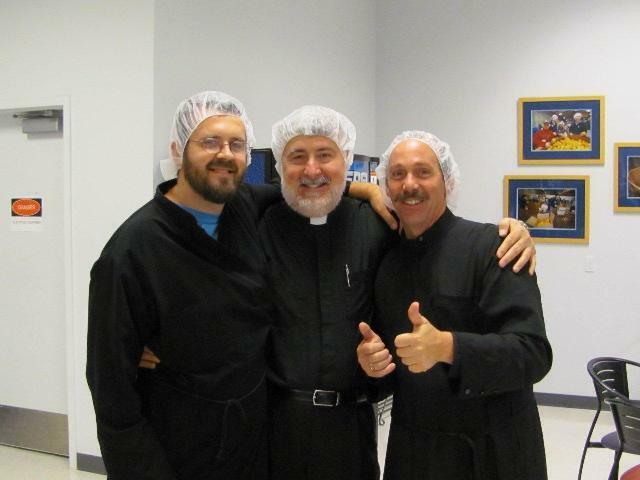 We visited this facility and, following a brief orientation, packaged rice for shipment to their affiliate food banks. 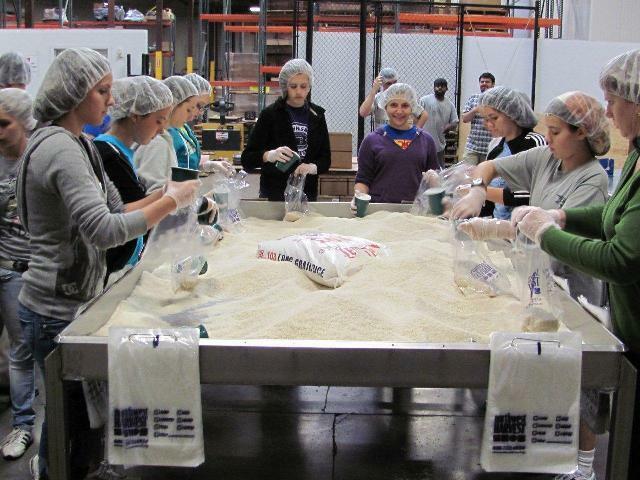 The tasks included making boxes, measuring rice into family size packages (each bag feeds a family of four), packaging them into boxes of ~15 bags, and stacking them on pallets for distribution. We worked side by side with the Northwest Harvest staff to package the rice. Every single member of the conference team pitched in and worked very hard for a little over an hour. 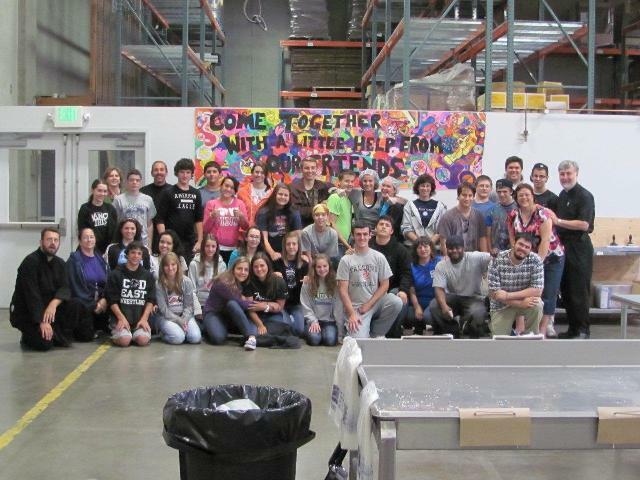 At the conclusion of the project we packaged 5,275 lbs of rice that will contribute to 4,795 meals for the needy. It is amazing that in such a small amount of time we can make a huge difference. Very special thanks are owed to Shailyne Malone and Elle Hunter and their staff. Shailyne went above and beyond to make this project work and Elle, who guided us throughout the project, is a true champion of feeding nutritious food to the hungry residents of Washington. After returning to SPU for Vespers followed by dinner, Becky Kesic handed out our tee-shirts for this year’s conference. The shirts are dark green tye dye and say, “be true to who you are” and have the dates and location of the sixth annual conference. Father Stevo then recapped the service project with the group. Then we moved to the classroom for movie night where we watched Bella, an inspirational movie about two people who were dealing with incredibly difficult issues in their lives, and came together to help each other out, unconditionally. Father Stevo led a discussion about the movie and how it applies to our theme and our lives as Orthodox Christians. The evening concluded with free time before lights out at the end of a long day. Saturday morning started bright and early with Matins in the lounge followed by breakfast. Then the group took a bus to the All Merciful Saviour Orthodox Monastery on Vashon Island, WA. To get to the monastery we had to take the bus on a ferry. We went to the top of the ferry onto the observation deck and watched the beautiful scenery as West Seattle fell behind and Vashon Island approached. Father Abbot Tryphon met up with us on the ferry and gave us some of the history of Vashon Island as we drove from the ferry to the monastery. When we arrived at the monastery we were truly amazed at what God, through the monks have created. It is one of the most peaceful places on earth. Father Tryphon gave a brief history and a tour of the monastery including the gardens, trails, church, library, office, and grounds. Then Father Tryphon told the history of a replica icon in the church of the Theotokos. The original icon is a myrrh flowing icon. The church has cotton soaked in that myrrh that he anointed everyone in our group, including the bus driver. The monks prepared a delicious lunch of bean soup over rice, salad, homemade bread, and chocolate cake. After fond farewells, we left the monastery for the return drive and ferry ride to Seattle. Once we were back in the city we were dropped off at Pike Place Market for shopping. Four groups wandered the market for a little over an hour seeing some of the sights, like the flying fish, and purchasing items to remember their trip to Seattle. After shopping we went to the Crab Pot for a delicious dinner coordinated by committee member Joyce Yovetich. After an appetizer of crab legs, we had the choice of several delicious seafood entrees. Everyone went away pleased with their dinner. At the conclusion of dinner we were picked up by a duck boat and went on a tour of downtown Seattle and Lake Union. The teenagers cheered, quacked, and even may have learned something while having a fantastic time on this unique tour of Seattle. After the duck boat it was time to return to the SPU campus for our final conference wrap-up session. The wrap-up session, led by Father Stevo, Father Dragan, and Father Russell focused on reviewing some of the things we learned this week, what we liked, and what we think can be improved. There was additional discussion about why attendance at conferences is so low and some ideas for improving the number of teenagers who take advantage of this great opportunity. Then we talked about next year’s conference and came up with a theme: “Overcoming Temptation in My Life.” The preliminary location is Boston, MA and it will, once again, be at the end of June. The group also felt that a name change is in order. Going forward, the event will be called a retreat, instead of a conference in an effort to improve confusion about what the event really is. The final discussion topic was around naming of a new facebook group managed by the committee for the purpose of communicating as a group and keeping up to date on future conferences and projects. The group came up with the name “Youth of the Serbian Orthodox Church” which will be created in the coming week. The activities concluded with each participant completing a survey related to the conference and writing a paragraph related to their experience that will be printed in the Path of Orthodoxy in the coming months. On Sunday morning the entire group was up early to finish packing, check out, and get our ride to church. After Divine Liturgy in a full church at St. Sava in Issaquah we were treated to a delicious luncheon by the parishioners of the church. 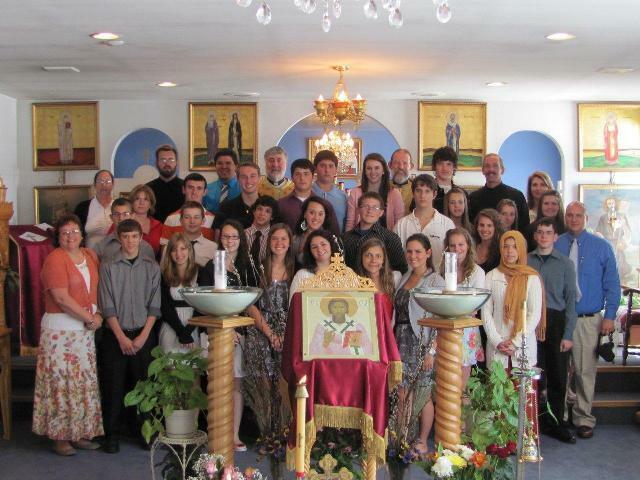 Then, after some tearful goodbyes, everyone departed the church for home, carrying with them hundreds of memories from the sixth annual youth conference of the Serbian Orthodox Church. Mark your calendars for the the Seventh Annual Youth Retreat, June 20-24, 2012 in Boston, MA. His Grace Bishop Maxim and the people of the Western American Diocese: for opening their doors and hearts and hosting this year’s conference. His Grace Bishop Longin, His Grace Bishop Mitrophan, and His Grace Bishop Georgije: for their continued support of these conferences and all of our youth ministry activities. Father Ilija and all of the parishioners of St. Sava Serbian Orthodox Church, Issaquah, WA: for being gracious hosts and assisting with coordination of local activities including a luncheon at the conclusion of our conference. Abbot Tryphon, Father James A. Bernstein, Father Serafim Gascoigne, and Dr. Philip Mamalakis: for participating in inspirational panel discussions to help all of our teenagers grow in our faith. The staff of Northwest Harvest, especially Shailyn Malone for finding a last minute opening for our service project and Elle Hunter for the great guidance, instruction, and leadership. You both exhibit a passion for helping others that is a model for all of us. Melissa and Andrew Engstrom, residence life coordinators for Moyer Hall, for assisting with needs in the dormitory as well as with identifying a service project on very short notice. Hollie and Rich Benton for presenting information about OCF to the teens. Our chaperones: Becky Kesic, Joyce Yovetich, Sharon Young, Beth Bratkowski, and Mary Perisich, who tirelessly worked with our youth, coordinated activities, ran errands, and demonstrated their love for our children and the future of our church. Seattle Pacific University, especially Lisa Burhenn and the Conference Services staff: for being gracious hosts and providing a fantastic facility for our retreat. Their assistance prior to the conference and throughout the week was critical to the success of the event. All members of the Youth Ministry Committee: Their diligence and perseverance have resulted in another very successful conference for our youth. The effort they put forth and the resulting impact to our children show that Christ is in our midst and always shall be. Anyone else whom I inadvertently forgot to mention: organizing an event such as the annual youth conference takes assistance from many people. If I inadvertently forgot to mention anyone here please know that your support and assistance is greatly appreciated. Once again, the youth who participate in these conferences are an inspiration for everyone who witnessed the retreat. By the Grace of God we will continue our efforts to reach out to our youth, engage them, and help them grow in their faith. We hope to see these teens and more next year for our Seventh Annual Youth Conference to be held in Boston, MA in June, 2012. Mark your calendars!